I have a confession to make. I LOVE Peeps. Like really love, like in college I could buy that 12 pack of them and eat them all in one sitting love. I know they are sickly sweet. I know that I would probably go into a diabetic coma if I knew how much sugar was in them. But I still love them. And my love for them isn't just contained to chicks and rabbits. I am that person who buys the Christmas and Halloween ones too. I mean who doesn't love a pure sugar ghost, or Christmas tree, or maybe even a bat? 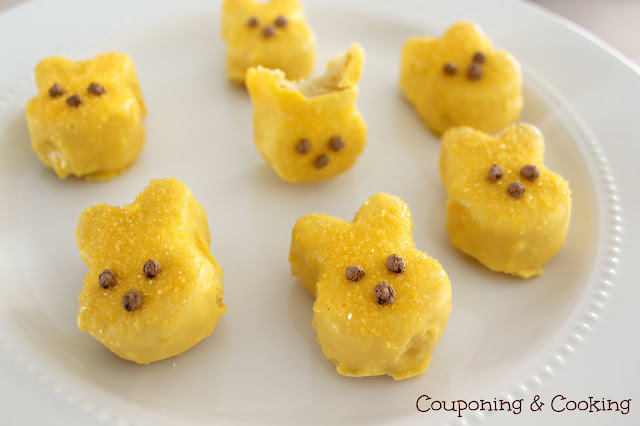 I constantly pin cute Peep desserts and ideas. Speaking of that, have you checked out Love From The Oven's Peep recipes? Her website alone could have me pinning for hours. So here lies my problem. A majority of what I make for the blog gets consumed by Justin and his fellow firefighters. If I made something with Peeps, he wouldn't eat any of it and I would have to sit and eat them all by myself. Which wouldn't be the worst thing in the world except for the fact that I would be on a sugar high for the rest of the week. 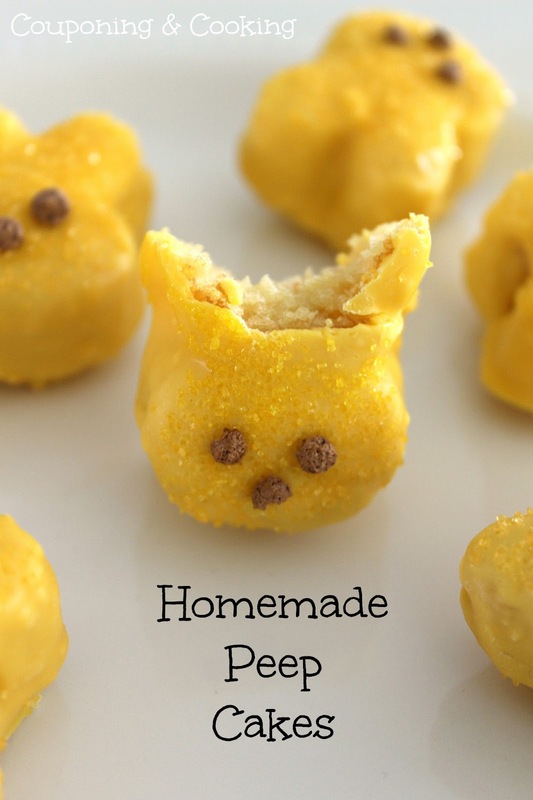 Justin's hate of all things Peeps notwithstanding, I wanted to make something "Peepy" without actually using Peeps. Because nothing says Easter like sparkly sugar coated rabbits and chicks. I was racking my brain about what to make when I remembered this Wilton Silicon Bunny Cake Pan I got at last year's Target Easter Clearance (where else?). I made the bunny cakes using basic yellow cake mix and then froze them to make it easier to dip them. 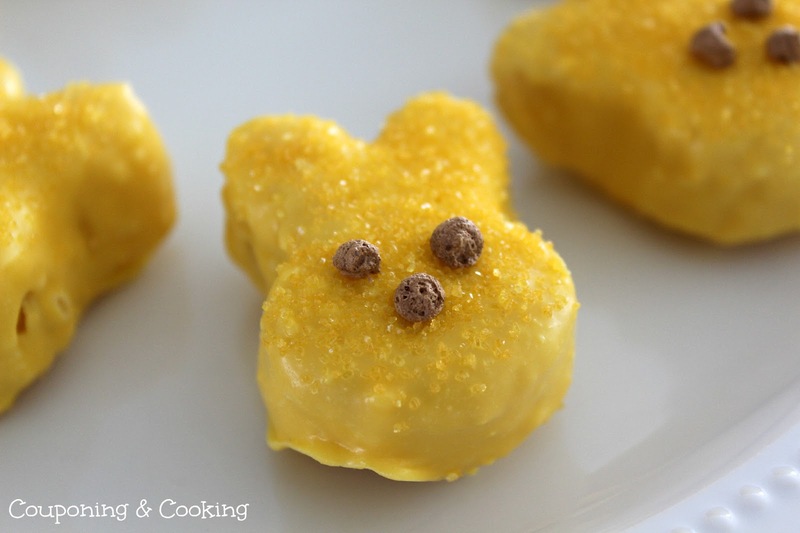 I dipped them in Wilton Yellow Candy Melts , covered them in yellow sparkling sugar and gave them eyes and a nose with cool whip mixed with cocoa powder. They tasted like a homemade version of a Little Debbie cake roll. Creamy candy melt on the outside and golden yellow cake in the inside. 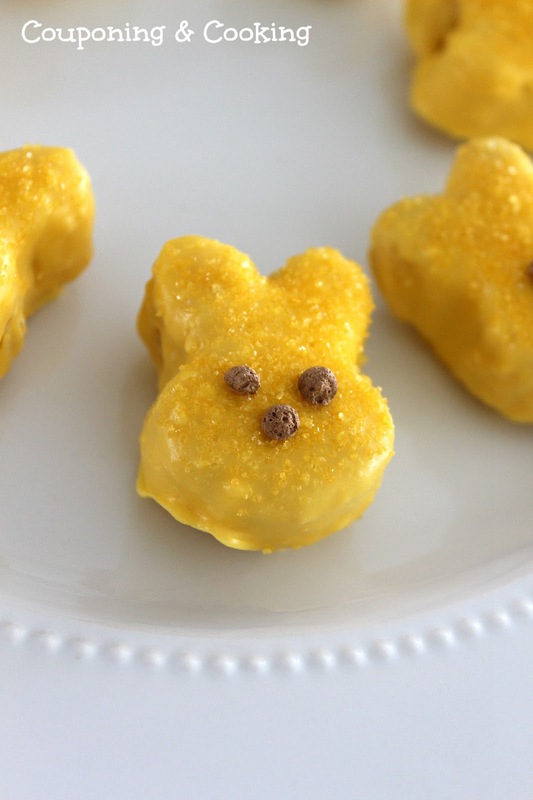 The colored sugar added the perfect crunch just like it does on the outside of real Peeps. And guess what? I still have some mini bunny cakes frozen in our freezer. 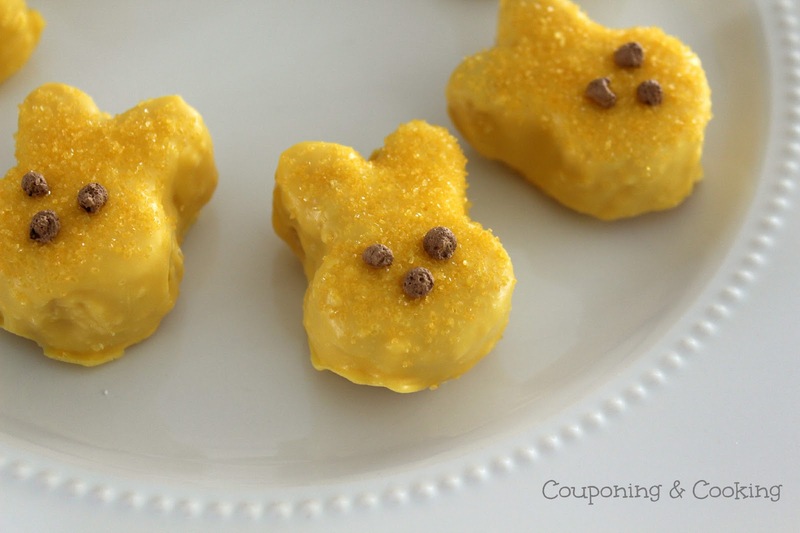 So I can have my Peep cakes and eat them too, long after the Target clearance section has been wiped out.